What if one book, one concept, one guide, could reveal to you how to bust through communication barriers, keep top talent, and grow your emerging leaders? What if it shared exactly what to say and how to say it so that both you and your team member get amazing outcomes? Would you read it? THIS IS THE BOOK. This step-by-step guide will show you how to coach your team members to develop the skills that will increase their impact and contribution to the organization. 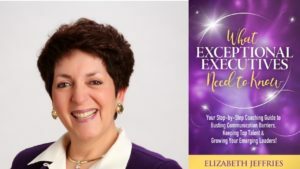 What Exceptional Executives Need to Know is packed with tips, checklists, resources, and real stories, making this the most valuable one-stop tool available for building your role as a coach to your team members. If you know you have a book in you and just can’t quite get it out, you need Cathy Fyock! Cathy is skilled in asking you the questions to get clarity in your goals and help you focus your message. Her proven book coaching process will assure you stay disciplined to complete your book in your set time table. I could never have completed my book in three weeks without Cathy’s knowledge, skill and accountability process! Her gentle, but firm and loving encouragement kept me going to get to the finish line! To order your book follow this link.